You are here: Home / Money / Business / Omarosa Manigault vs Donald Trump: All About The Mid Term Elections. Omarosa Manigault vs Donald Trump: All About The Mid Term Elections. 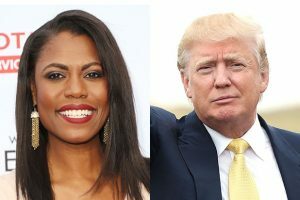 (ThyBlackMan.com) Candidly folks, I have not paid much attention to the Omarosa/Trump soap opera. For the past few weeks, my wife Mary and I have been in Arizona with the Conservative Campaign Committee intensely campaigning for Dr Kelli Ward for US Senate. August 28th is the primary election. This may sound surprising coming from a black guy, but I do not care if Trump used the N-word. All I know is president Donald J Trump is doing an awesome job for my country. I think of that Bible verse that says “He that is without sin among you, let him cast the first stone at her.” As I have stated in numerous articles, leftists freely use the N-word, including calling me a “stupid n*****” for simply loving my country and not viewing myself as a victim. Trump has black unemployment at historic lows. https://washex.am/2LdUohM Countless times, to no avail, I’ve tried to explain to black family members who viewed Obama has their Great Black Hope that Obama’s sole mission was to further the American left’s anti-God and anti-American agendas. His skin-color was only a weapon to silence anyone who opposed him ignoring our Constitution while implementing initiatives to punish America for being mostly white, extremely successful and the world power. This latest fake news media created firestorm featuring Omarosa is simply more of the American left desperately attempting to keep the public’s focus off Trump’s remarkable achievements for We the People thus far https://bit.ly/2AVaNlx – to block his make America great agenda and remove him from office. This is the goal of every fake news media story 24/7. Please get involved in the mid-term elections. https://bit.ly/2vLaIkw Quoting my wife’s favorite comic, Larry the Cable Guy, “Let’s git er done!” for America.